Hrushevsky wrote the last volume in difficult social and historical conditions, when any attempt to determine the national dominants in literary progress was branded as “bourgeois nationalism.” The sixth volume appeared in print rather late, and the publication was assisted by the diaspora. In this volume the author dealt with material that showed that Ukrainian literature, as well as the Ukrainian nation, was in the center of the European guidelines during the Baroque period; it reflected the European cultural experience — and this ruined the Soviet propaganda concept of the cradle of three fraternal peoples. The Baroque period is partially represented in the fifth and sixth volmes of Hrushevsky’s History of Ukrainian Literature. The 16th, 17th, and 18th centuries witnessed complicated misunderstandings, religious confrontations, and national liberation movements, including the Cossack period. It was then that the Ukrainian people started becoming aware of itself historically as a full-fledged nation, when the national code was generated and national singularity asserted. On the other hand, against the backdrop of social and historical processes, Hrushevsky succeeded in demonstrating a polylogue of cultures and mentalities that were adapted to Ukrainian literature. The latter shared the experiences of other literatures on the ideological-thematic, genre, and poetic levels, maintaining close contact with them. As for the main landmarks of the Baroque period traced by Hrushevsky, the following appear worth mentioning: “Cossack Campaigns in the Interest of the Church,” “The Church-Cossack Union,” “Pletenytsky and Sahaidachny,” “Organization of Kyiv Brotherhood,” “Kyiv’s 16th-17th-Century Contacts with Western Europe,” “Measures Taken by Pletenetsky to Organize a Cultural Center at the Lavra Caves Monastery,” “Lavra Group’s Major Writings. Works by Kopystiansky,” “Kyiv and Lutsk Brotherhoods,” “Brotherhood Students in General and Those in Kyiv in Particular,” “Smotrytsky Defending the New Orthodox Hierarchy,” “1622 Sejm Campaign,” “Supplication of the Orthodox Szlachta; Boretsky’s ‘Justification,’” “Ukraine’s Relations with Muscovy until the Early 17th Century,” “Smotrytsky’s ‘Paraenesis.’ Draft Ukrainian Patriarchate Project,” “Mohyla and his Followers’ Triumph,” etc. 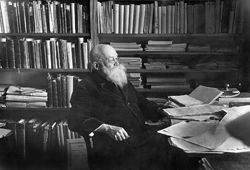 Hrushevsky’s method of scholarly inquiry consisted of singling out the most important works from the list in every chapter, proceeding from historical criteria and context (I have mentioned that most texts at that period were ideologically engaged, each being written with a certain practical purpose in mind, in the course of polemic, and so on. After determining the reasons behind a given writing, the author’s task, etc., Hrushevsky would proceed with literary analysis, often quoting large passages, so as to dot the i’s and cross the t’s and help the reader perceive them anew, considering that some of the quotes were from texts that were hard to find anywhere at the time. Hrushevsky notes: “The revival of Kyiv as a cultural and national center, after so many centuries of decline, being reduced to a backwater province, is accompanied by a keen awareness of its former glory, related historical events, political and cultural achievements, and claims.” He emphasizes Kyiv’s decisive role as a cultural and religious center, juxtaposing Kyiv’s cultural legacy with that of Galicia (Halychyna): “One is prompted to assume that the tradition of former strength, glory, and might of the Ruthenian people and their Orthodox Church, revived, duly demonstrated and documented as it is, could and should have been used to counterpoise the Polish Roman Catholic onslaught, considering the quick pace at which it was spreading all over the Ruthenian lands, and which only recently brought forth the moods of despair and helplessness within in Orthodox quarters. Kyiv witnessed a new phase in the struggle for national rights, when cultural and religious life received a fresh impetus: “It is safe to assume that during this period historical traditions were revived in Kyiv, and that it was one of the secrets that helped step up the literary process. The national cause, struggle for national and social rights were increasingly often proclaimed as serving religious causes. Historical traditions were revived to back the national claims of the moment, ditto the religious ones, considering that Kyiv’s tradition was deeply rooted in religion. He paid special attention to Palinode, stressing that it ranked with the most distinguished works at the time, referring to the Lavra Group’s attainments. It is also true that there were worldview, ideological reasons behind this emphasis. This work reflected the conceptual foundations of the History of Ukrainian Literature and the principles of selecting texts that made up the core of the canon. Hrushevsky attached considerable importance to [Kasiian Sakovych’s eulogy] Virshi na zhalosnyi pohreb zatsnoho rytsera Petra Konashevycha Sahaidachnoho... (Poems for the Grievous Funeral of the Knight Petro Konashevych Sahaidachny, 1622). He wrote a separate chapter with a textual and conceptual analysis, describing the structure of Sakovych’s book, adding the hetman’s biography, dwelling on the poetic composition and context, and at times resorting to emotional comments (e.g., “Afterword Afterwards,” which to a modern reader can actually imply a separate statement). Then there is this sentence: “This author wrote this book in honor of the Zaporozhian Host under his Polish Majesty’s command, wishing its men and officers the best of health and victories over the enemies of our Fatherland, by the grace of the Lord, for the lasting glory of the Blessed Trinity.” A very interesting apologia for Cossack freedoms. The scholar apparently wanted his reader to read his historical and literary commentaries, also as many poems as he could include, considering that they were hard to find in the bookstores and libraries at the time. In the chapter entitled “Revival of the Historical, National, and State-Building Tradition” the author of the History of Ukrainian Literature tries to link cultural-religious progress to the national trends and aspirations, asserting the social component, determining the religious and political ties in 17th-century literature. This chapter in the sixth volume of History of Ukrainian Literature appears to be the last one lacking the Russian vector. The next chapter proves that Hrushevsky’s analysis included the Russian political component that caused “hesitations about the Kyiv orientation”. The Moscow vector is becoming increasingly present in terms of history, culture, religion, and public life in Ukraine. Hrushevsky recalls I. Kosynsky’s suplika complaints in writing addressed to the tsar and the patriarch; letters from Boretsky and Yuzefovych; he analyzes what Sakovych and Smotrytsky wrote (Smotrytsky’s letter to Boretsky, concerning Apologia, Paraenesis, Exegesis , and other works). I cannot dwell on these chapters in Dmytro Chyzhevsky’s History of Ukrainian Literature for want of room, due to newspaper format. Instead, I will focus on Metropolitan Petro Mohyla. “On July 17, Mohyla ceremoniously entered Kyiv with his entourage made of clergymen, szlachta, and members of his court to take his religious chair…” This is the final statement in Hrushevsky’s analysis of the first half of the 17th century in his sixth volume. This publication was meant as the first part of the sixth volume, but, as mentioned previously, no other publications dedicated to that period were found. Under the circumstances, this historical date ends Hrushevsky’s concept of Baroque literature in his History of Ukrainian Literature. Hrushevsky’s concept of the Baroque period in his History of Ukrainian Literature is an important component of the metahistorical system of Ukrainian history and culture. It demonstrates a model of cultural/spiritual progress, generates a historical image of Ukraine as an original body politic that has always sought independence, or at least an autonomous status within an empire, with its own cultural-historical mentality. Hrushevsky’s concept of Baroque Ukrainian literature emerges in conjunction with the social and religious processes in Ukraine at the turn of the 17th century. Analyzing Baroque texts, Hrushevsky notes their textual panoramic view, their background, the authors’ desire to complicate the Baroque-style plots, also the synthesis of their creative origin. Mention is made of the subjectivity of such Baroque texts and the involvement of the polemic process. This literary style often proves antinomic. The spiritual component often turns out predominant. The Baroque image-bearing component is based on the antique, medieval matrix, and yet the images appear purely Baroque-style. In conclusion of his foreword, Hrushevsky acknowledges the nation-asserting character of his work, meant to help unite the Ukrainian nation: “At this time of ordeal, with a big political an social crisis having split and cast so far apart the various sections of the Ukrainian citizenry, the culture of our achievements, made over a 1,000 years, is that ground upon which our diversified and estranged cultural groups will converge to do the kind of work that a hundred years ago awakened our people from its national lethargic sleep. Literature will serve to guard them. What happened to Ukrainian aristocracy? Was St. Volodymyr born in Volyn?